Simply put, the Bennington S Series Pontoon Boat was designed to be the perfect fishing and cruising boat. 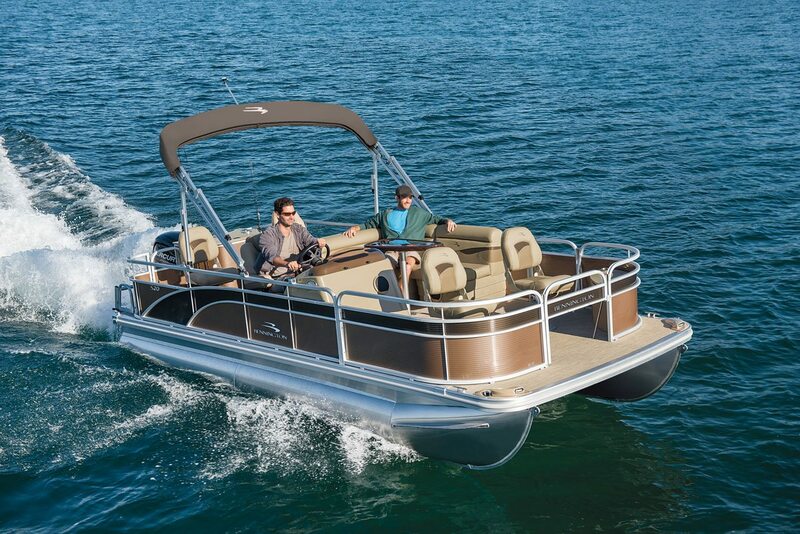 While pontoons have long been the preferred choice for fishermen and those looking to enjoy a leisurely cruise on the lake, Bennington takes it to an entirely new level with the popular S Series. The Bennington S Series provides value without compromise. Each and every detail has been carefully designed to emphasize style, comfort, and functionality that are both approachable and desirable; we didn’t skimp on luxury. Available in fishing and cruising models ranging from 16’-23’, we’ve reinvented the pontoon boating environment to accommodate your needs. The beautiful bow seating in the S Series has dual chaise lounges upholstered in a variety of vinyl choices. The luxury S21 Cruise pontoon includes an L-shaped corner lounge and sun pad lounge with storage compartment. At the fiberglass helm, you’ll find a 12-volt outlet, auxiliary input jack, and USB charging ports; the S Series “cruise” options are virtually limitless. On the S Series Fishing layouts, we took the ordinary fishing trip and made it a fishing experience. There is an optional Pro Angler Fish Station, which includes a large livewell, integrated tackle boxes, a fish cleaning counter top, and a lower storage drawer. Share great moments with friends and family, or pass along a fishing tradition in comfort from the deluxe, foldable bass seats located at the bow or stern. When you invest in a Bennington Pontoon Boat, you’re investing in the confidence of knowing that you’re covered by the best warranty in the business. Bennington‘s 10-year bow-to-stern warranty covers 100% of materials and parts and labor with no pro-rating, no third-party handoffs, and no warranty transfer fee. Bennington even covers 100% of the retail-shop labor rate at all Bennington Pontoon Boat dealers; meaning your boat will be a top priority if it ever needs to be taken in for repair. For specific warranty details, please visit https://www.benningtonmarine.com/warranty/. Start designing your dream Bennington Pontoon Boat today at our online design center, where you can hand select each and every feature for the perfect boating experience. Bennington Pontoon Boats is family-owned and operated in Elkhart, Indiana. We’ve been crafting the industry’s leading high-performance, luxury pontoon boats since 1997. Learn why we’re the best at https://www.benningtonmarine.com/construction/.